I could add another 10 symptoms to the list, but I’m sure this has already caused you some nausea. It doesn’t matter if you are a sales manager attempting to do the coaching or the sales person on the receiving end of the coaching, you probably feel the same way. I’m tired of sales training, I’m tired of going to the same classes over and over again, I’m tired of telling my people they have to do a better job at cross-selling, getting introductions, networking and asking for the business. In the end, everyone is sick and tired because, after all the training time, after all the role-playing and after all the investment of money, you look at the results and not a lot has changed. How come? Well, because you can’t coach TALL. My daughter (recently engaged - thank you) played basketball in 7th grade. She then tried volleyball but found her love of performing in front of others, not on the fields or courts of athletics, but on the stage of music and theatre. I was watching her basketball practice one day and was thinking she had a chance to be a player on the high school team, but she would need a lot of work on the fundamentals: handling the ball, keeping the ball up when rebounding and pivoting while in the low post. After practice, I went to the coach and asked him what he thought. You see, Alex in 7th grade was already almost 6’ tall. She could out rebound people because they simply couldn’t reach the balls that she could reach. She was good enough on defense and blocked out well so she had some things going for her that helped her overcome any weaknesses she had that might have kept a shorter player from being a starter. (Watch this exception to the rule.) Besides, she had dad, a former coach, to keep her working hard and disciplined. 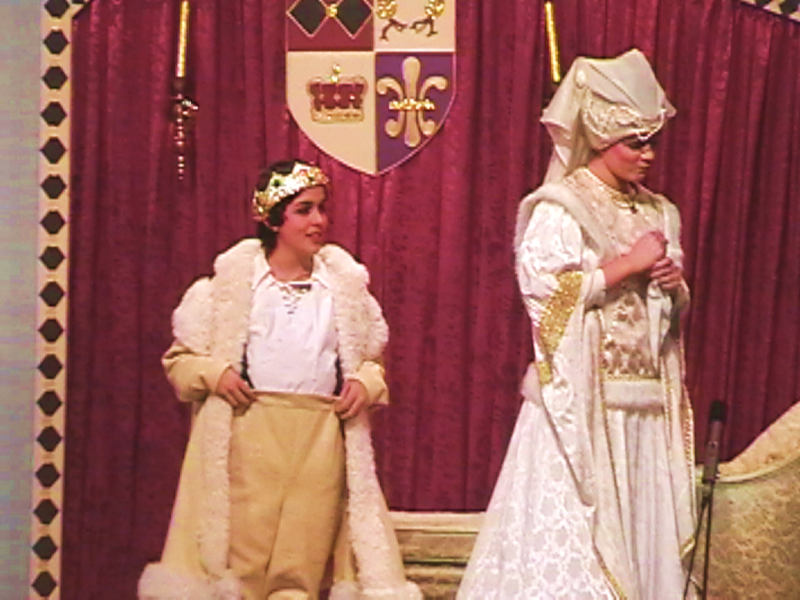 **Note: Alex’s height created an interesting sight on the stage when she played the queen in Cinderella. With her hair pushed up on her head and a crown she was at least 6’4”. The leading man… about 5’4”. It was funny. Problem: I don’t have time to prospect. I have too much account management work to do. Solution(s): Assign account managers (and they still won’t prospect, they’ll just find another excuse) or enroll them in a time management class. SO…that isn’t the answer for dealing with excuses (audio). This addresses the root issue. I can guess that you’re thinking that it cannot be that simple. I assure you can call anyone of the hundreds of salespeople we’ve coached or salespeople we’ve trained and they will ALL tell you that IT makes a difference. It changes things because you’re now dealing with the correct end of the problem! Even though there are some obvious areas of weakness, this candidate is recommended for hire. 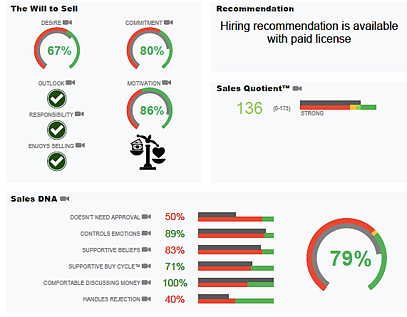 (When a hire is made based on a "recommended for hire" finding, like this candidate, 92% of the time that candidate will be a successful sales person.) The benefit of having this information is that, if you were to hire this individual, you would know the extent of your "project" and exactly what you would need to do to help them be successful in your organization. However, having said that, there are still factors that need to be considered. Look at the work that has to be done... AND notice this: the findins say they are trainable but are not considered coachable. Do you want to take that on? Do you have the bandwidth to take that on? If not, then this is a hire that shouldn’t be made. Now, consider how many of your people today might look like this and what’s that costing you? How effective is your sales team today?